Acqua in White Bear Lake has three dining spaces: inside a house and on the adjoining sheltered deck (pictured above) which overlooks the marina and a lakeside patio. The patio is across the street so staff run back and forth. David and I have told several colleagues how amazing it is....really nice staff and locally sourced ingredients in Italian-inspired dishes. We like to share an appetizer, get one or two salads and split an entree. What we've had was excellent (Appetizers: Crostaceo, Carpaccio, Mais; Salads: Formaggio Arrostito, Insalata di Caesar; Entrees: Ossobuco, Saltimbocca, Gamberi e Capesante). The deck and patio areas are intimate and worth the wait. The Fresh Ginger Jameson was out-of-this-world! Handcrafted Cocktails with nice views of White Bear Lake. Reservations for indoor eating only. Their website has information about both the White Bear Lake and Forest Lake locations. Be prepared for smiles and a strong desire to jump. 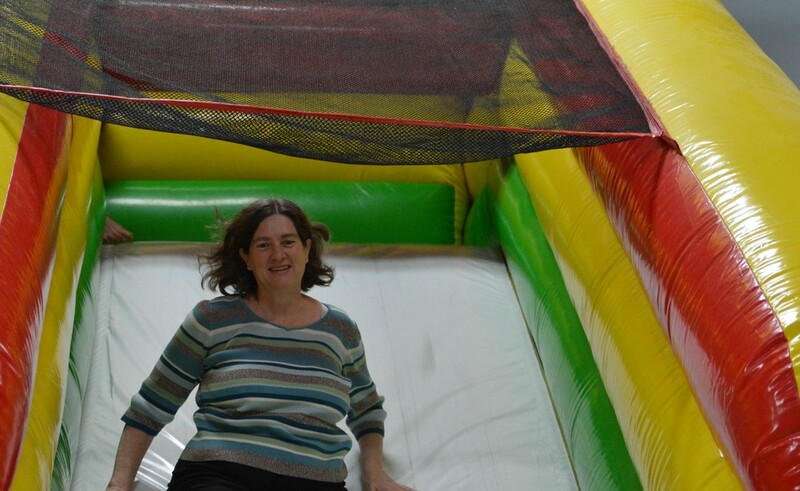 I declare it impossible to bounce around in the inflatables at Monkey House and be in a bad mood. Brooke, Nicole and soon to arrive baby James coasting down an 18' slide.